If you’re struggling to lose weight and you can’t seem to find the answer then it may just be the food that you’re eating. 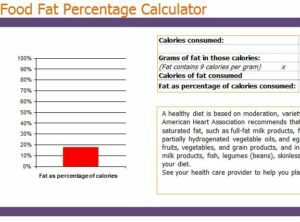 The free Food Fat Calculator is a simple template that you can use to calculate the total fat percentage of all the food you consume in a day. The document even provides you with a graph that shows you how much fat you should be consuming on a daily basis as well. If you’re ready to start losing the weight and track the fat percentage of your food, then download the free template today and follow the guide given below. You will start by download the free document by clicking the link at the bottom of this page. Once you have the document open, then you can simply start filling in the information. 1. Enter the calories consumed & grams of fat. In the table you see below, you will enter the calories consumed sand the grams of fat that are given on all food packages. The template shows you an example of what you should enter. Delete the example information and enter your own. 2. The total calories of fat consumed and fat as % of calories consumed will be calculated. The template will then take the information that you enter and show you the fat percentage in the graph below and at the bottom of the table. From the example given, you will see that the fat percentage consumed for that item is 18%. Noting that fat provides 9 calories per gram, you need 36 to 62 grams of fat when consuming a 1,600-calorie diet per day (which is average). The Food Fat Calculator is a powerful tool that can allow you to accurately track your fat consumption and change your routine to start losing weight.